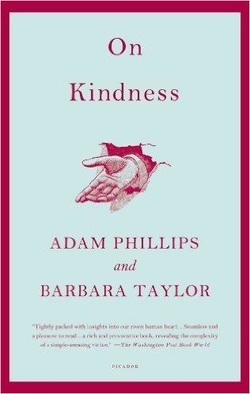 So argue psychoanalyst Adam Phillips and historian Barbara Taylor in the plainly titled, tiny, enormously rewarding book On Kindness (public library). Today it is only between parents and children that kindness is expected, sanctioned, and indeed obligatory… Kindness — that is, the ability to bear the vulnerability of others, and therefore of oneself — has become a sign of weakness (except of course among saintly people, in whom it is a sign of their exceptionality)… All compassion is self-pity, D. H. Lawrence remarked, and this usefully formulates the widespread modern suspicion of kindness: that it is either a higher form of selfishness (the kind that is morally triumphant and secretly exploitative) or the lowest form of weakness (kindness is the way the weak control the strong, the kind are only kind because they haven’t got the guts to be anything else). If we think of humans as essentially competitive, and therefore triumphalist by inclination, as we are encouraged to do, then kindness looks distinctly old-fashioned, indeed nostalgic, a vestige from a time when we could recognize ourselves in each other and feel sympathetic because of our kind-ness… And what, after all, can kindness help us win, except moral approval; or possibly not even that, in a society where “respect” for personal status has become a leading value. We usually know what the kind thing to do is — and kindness when it is done to us, and register its absence when it is not… We are never as kind as we want to be, but nothing outrages us more than people being unkind to us. There is nothing we feel more consistently deprived of than kindness; the unkindness of others has become our contemporary complaint. Kindness consistently preoccupies us, and yet most of us are unable to live a life guided by it. The forms kindness can take … are partly learned from the societies in which we grow up, and so can be unlearned or badly taught or resisted… Children begin their lives “naturally” kind, and that something happens to this kindness as they grow up in contemporary society. Everybody is vulnerable at every stage of their lives; everybody is subject to illness, accident, personal tragedy, political and economic reality. This doesn’t mean that people aren’t also resilient and resourceful. Bearing other people’s vulnerability — which means sharing in it imaginatively and practically without needing to get rid of it, to yank people out of it — entails being able to bear one’s own. Indeed it would be realistic to say that what we have in common is our vulnerability; it is the medium of contact between us, what we most fundamentally recognize in each other. The child’s first, formative trauma is his growing acknowledgment of his need for others (in actuality the mother is as vulnerable to her need for her baby as the baby is to his need for her; parents need their children not to worry them too much). The needy child experiences a trauma of concern (“How can I take care of my mother to ensure that she takes care of me?”), which calls up his natural kindness; but this concern — and the later forms of kindness that emerge from it — is too easily turned away from. This turning away we call self-sufficiency, and when we want to pathologize it we call it narcissism. The pleasure of kindness is that it connects us with others; but the terror of kindness is that it makes us too immediately aware of our own and other people’s vulnerabilities (vulnerabilities that we are prone to call failings when we are at our most frightened). Vulnerability — particularly the vulnerability we call desire — is our shared biological inheritance. Kindness, in other words, opens us up to the world (and worlds) of other people in ways that we both long for and dread. If there is no invulnerability anywhere, suddenly there is too much vulnerability everywhere. It is not that real kindness requires people to be selfless, it is rather that real kindness changes people in the doing of it, often in unpredictable ways. Real kindness is an exchange with essentially unpredictable consequences. It is a risk precisely because it mingles our needs and desires with the needs and desires of others, in a way that so-called self-interest never can… Kindness is a way of knowing people beyond our understanding of them. By involving us with strangers (even with “foreigners” thousands of miles away), as well as with intimates, [kindness] is potentially far more promiscuous than sexuality. But … the child needs the adult — and his wider society — to help him keep faith with his kindness, that is, to help him discover and enjoy the pleasures of caring for others… People have long known this, and long forgotten it. The history of kindness … tells the story of this knowing, and forgetting, and reknowing, as central to Western ideas about the good life. In the remainder of the altogether wonderful and acutely necessary On Kindness, Phillips and Taylor explore how we can build a society that nurtures rather than corrupting our natural kindness by learning, from childhood on, to feel comfortable with the uncomfortable risks of making ourselves vulnerable enough to be kind. Complement it with Einstein on kindness, Brené Brown on the crucial difference between empathy and sympathy, Adam Smith’s underappreciated wisdom on benevolence, and George Saunders’s magnificent commencement address on the power of kindness, then revisit Phillips’s insightful mediations on balance and the necessary excesses of life and the essential capacity for “fertile solitude”. "Why We Hurt Each Other"
5 Books to Help You Build Better Habits. Alain de Botton on Self-Help Books. The two Basic Mindsets that Shapes Our Lives. 9 Summer Reads for Ambitious People.